For more than a century, the Hockney Company has designed, manufactured and sold weed cutters to government agencies, corporations, resorts and to private homeowners. Our customers include the U.S. Department of Wildlife, the U.S. Department of Agriculture, and the Army and Navy Corps of Engineers. Aquatic weed control is essential to a wide variety of environments including bathing beaches, lake front property, reservoirs, fish hatcheries, industrial parks, golf course water features, ponds and marinas. Hockney machines are the most dependable, best built, highest quality machine, that has been delivered all over the world. Begin exploring how the Hockney machines can help solve your weed concerns. TruxorUSA is proud to introduce the TRUXOR amphibious machine. Built in Sweden to be tough and reliable, the Truxor machine has been used throughout the world as a weed cutter for pond and lake weed control and for dozens of other tough jobs. 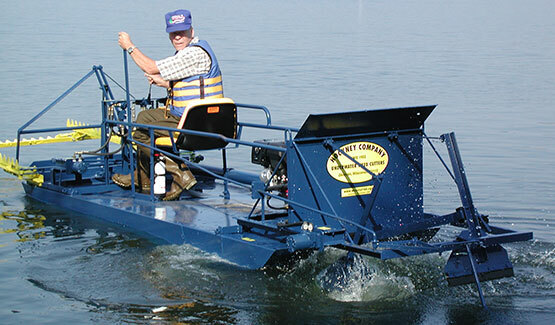 Hockney Company is proud to provide two brands of underwater weed cutting machines. The Swedish made, Truxor is ideal for municipal needs that want to buy a tool once, based on quality and high manufacturing standards. The Hockney brand is American made, constructed by hand, and delivered by the people that built it. Hockney is constructed with the same attention to quality that the Truxor is, but is created for the home owners association budget restraints. For more than 100 years, the Hockney Company has been designing, manufacturing and selling underwater weed cutters and pond and lake weed trimmers.